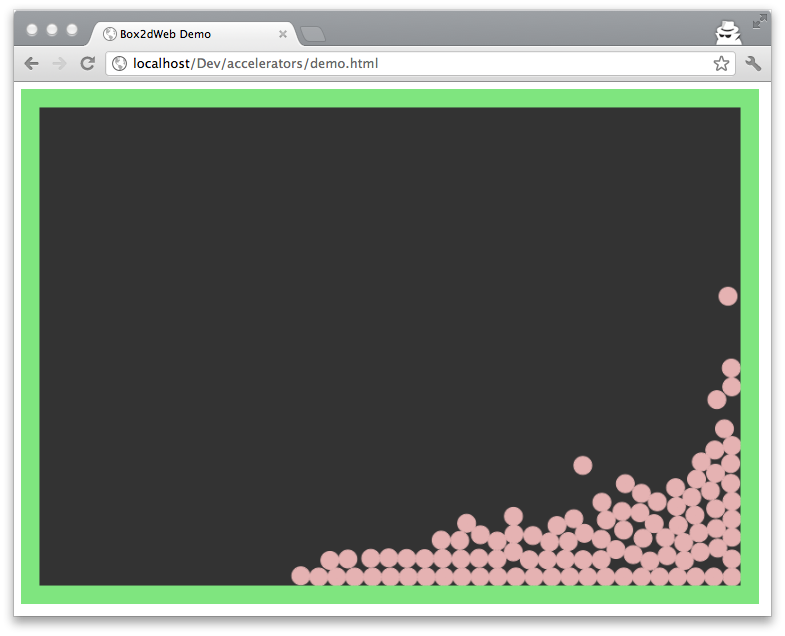 You can test this for yourself here: “Box2dWeb and deviceorientation demo”. As you can see, besides a lot of other info, we receive an alpha, beta and a gamma. For my macbook I never receive an alpha value. For this demo I want to roll all the balls, from the image, to the left when I tilt my laptop to the left and they should roll to the right when I tilt my laptop to the right. The same goes for when I tilt my laptop backwards, the balls should roll to the top and when I tilt my laptop downwards the balls should roll to the bottom. In this listing I start listening for the event and retrieve the new X and the new Y gravity based on the tilt of the laptop. When the tilt has changed, I set the new gravity of the physics world and wake up any sleeping bodies (see below for more info on this). And that’s all you need to do.